Fresh off a promotion to the world’s top competition, the South Korean men’s national hockey team will open its off-ice training camp next week. The Korea Ice Hockey Association (KIHA) said Thursday the players will report to Jincheon Training Center in Jincheon, North Chungcheong Province, some 90 kilometers south of Seoul, on Sunday. They will start their 11-week program the following day, through July 27. Coached by former National Hockey League defenseman Jim Paek, South Korea finished in second place at the International Ice Hockey Federation (IIHF) World Championship Division I Group A tournament late last month in Ukraine. It elevated South Korea to the IIHF World Championship, the top-flight competition in men’s hockey, for next May. Before the worlds, South Korea will make its Olympic debut on home ice at the 2018 PyeongChang Winter Games in February. In Paek’s regime, improved conditioning and team speed have been cited as keys to South Korea’s success. In Ukraine, South Korea relied on its superior quickness to apply effective forechecking and staged some third-period comebacks against exhausted opponents. For the upcoming camp, South Korea has recruited the help of EXOS, a U.S.-based training company, and its Korean trainer Lee Chang-ho will be on hand. The KIHA said the focus of the off-ice training will be to help minimize the risk of injuries and improve players’ overall strength and agility. It added that 23 players will first report to Jincheon, but up to two more players could be added during the course of the camp. Following the camp, South Korea will travel to Europe on July 28. It will split its time in Russia and the Czech Republic, and play professional teams from those countries in practice games. Tampa Bay Lightning goaltender Andrei Vasilevskiy posted his first shutout of the 2017 IIHF Ice Hockey World Championship following a 21-save effort on Thursday to lead Russia to a 4-0 victory over Denmark in Cologne. Russia (11 points) now owns three regulation wins and one shootout victory through four preliminary tournament games and leads Group A by two points over Latvia and the United States. Vasilevskiy has allowed just five goals while playing all but one period for Russia. His .945 save percentage ranks fifth and his 1.33 goals-against average sixth among all tournament goalies with over 100 minutes of ice time. Denmark held Russia without a goal for nearly two periods until the Russians finally broke through late in the second and scored three goals in a span of 1:10 to overcome a sluggish start. Russia added an insurance tally in the third period. Lightning forward Nikita Kucherov picked up an assist in the victory and now ranks tied for second in the tournament for scoring (3 goals, 4 assists). Vladislav Namestnikov didn’t record a point but had a shot and was plus-one in 16:54 for Russia. Denmark has now lost three of its four preliminary games. Russia returns to action Saturday when it takes on Slovakia. Canada survived a scare from host France, rallying from a goal down in Paris to win 3-2 and improve to 4-0 during preliminary play. France led heavily-favored Canada 2-1 late in the second period before the Canadians leveled the score on Claude Giroux’s power-play goal with 49 seconds remaining in the middle frame. Two of Canada’s three goals came on the power play. Marc-Edouard Vlasic supplied the winning goal for Canada unassisted 2:22 into the third period. Bolts forwards Brayden Point and Alex Killorn were held without a point in the victory. Point (14:19 time on ice versus France) ranks tied for fifth in the tournament for goals (3). Killorn (10:16 time on ice versus France) is still searching for his first tournament point. Canada, the Group B leader with 12 points, next plays Saturday against Switzerland. Team Canada is coached by Lightning head coach Jon Cooper. Behind a stellar performance by Bolts defensemen Victor Hedman and Anton Stralman and a 19-save shutout effort from goaltender Eddie Lack, Sweden edged Latvia 2-0 in Cologne. Sweden has now grabbed seven points through four games to pull into fourth place in the Group A standings (the top four teams from each group at the end of preliminary play advance to the quarterfinal knockout stage). Gabriel Landeskog broke the ice with the game’s opening goal at 9:13 of the first period. Elias Lindholm added a late tally with 3:18 remaining to seal the victory for Sweden. Hedman was plus-two with four shots and led Sweden for time on ice (26:41). Stralman notched three shots on goal in 21:44 time on ice. Sweden has a quick turnaround as it takes on Italy in an early game on Friday. Jan Kovar scored the overtime game-winner at 3:35 of the extra frame for the only goal in the Czech Republic’s 1-0 victory over Norway in Paris. The Czech Republic’s Pavel Francouz stopped all 10 shots he faced to post a shutout. The Czech Republic, which is tied with two other teams for third place in Group B, outshot Norway 32-10. 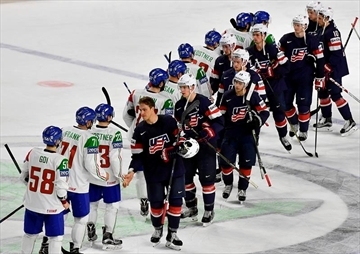 COLOGNE, Germany — Brock Nelson scored twice as the United States cruised to its third win of the ice hockey world championship with a 3-0 defeat of Italy on Wednesday. Nelson broke the deadlock with a wrist shot to the top right corner early on, then scored another in the second period, shorthanded, minutes before Anders Lee completed the scoring on a power play. Dylan Larkin had two assists. Jimmy Howard, who made 39 saves in the 4-3 win over Sweden on Monday, had a quieter game against the Italians, earning the shut-out with nine saves. The U.S. had 32 shots in comparison. Right wing Nelson of the New York Islanders was named player of the game. The Americans, with an average age of just 22.6 years, moved second in Group A behind Latvia, also on nine points but having played a game less. The U.S. opened with a surprise 2-1 defeat to co-host Germany on Friday before clocking up a 7-2 rout of Denmark on Sunday. Blashill’s roster now has a two-day break before putting its three-game winning streak on the line against Latvia on Saturday. Later Wednesday, Germany came from two goals down to defeat Slovakia 3-2 with Dominik Kahun scoring the only goal in a penalty shot shootout. Yasin Ehliz and Patrick Reimer had drawn the home side level with quick-fire goals in the second period. Germany, without forward Patrick Hager due to his two-game suspension for a slew foot in Monday’s 6-3 loss to Russia, moved fourth in the group on five points to boost its quarterfinal hopes. The top four from each eight-team group go through to the quarterfinals. In Group B, goals from Reto Schappi, Andres Ambuhl and Cody Almond gave Switzerland a 3-0 win over Belarus in Paris, taking the Swiss level on nine points with leader Canada. Canada, the two-time defending champion, was next playing co-host France on Thursday. Belarus remained bottom of the group after four straight losses. Finland gained a morale-boosting 5-2 win over Slovenia. Lauri Marjamaki’s side had been under pressure after giving away a three-goal lead before losing 4-3 to the Czech Republic in a shootout and after its shock 5-1 defeat to France. Wednesday’s win lifted the side third in Group B.